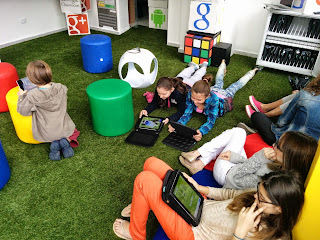 Editor's note: Today’s guest blogger is Eduardo Gomide, CEO of Foreducation, an organization created to deploy and manage the use of Google technology in the classroom. Eduardo is also the grandson of the founders of Colégio Mater Dei, a leading private school in São Paulo, Brazil. Today, Colégio Mater Dei is part of Weducation, a K-12 educational group comprised of seven campuses, 550 employees, and 3,000 students. Since 1962, Colégio Mater Dei has been a family-run school that prides itself on its adoption of innovative technology. As part of our move to incorporate technology into the academic environment -- inside and outside the classroom walls -- we started using Google Apps for Education in 2013 after noticing that teachers and administrators were using Gmail and Google Drive on their own. We’re already seeing great results; since introducing Google Apps to math and science classes, teachers report that our students are earning better grades on assignments and tests and are more engaged. Now, we’re taking things even further by creating the first ever physical Google Learning Space, a collaborative learning center where students of all ages come to read, learn, and share using technology in a specially designed environment. The colorful space is equipped with two Chromecasts, which students use to project assignments, presentations and videos from their laptops and tablets; two Smart TVs; a sound system; and a high-performance wireless network. The room is set up to accommodate a variety of learning activities -- students can choose from beanbags for independent reading, stools for guided instruction, or mats for interactive group work. In the Google Learning Space students can use the Google Apps they already enjoy using to home, while they are at school. As Mater Dei high school student Thiago Pinheiro says, “Google tools make my life easier and more versatile because I can work wherever I am without worrying about storage, access or the possibility of losing something.” At the elementary level, all students are using educational apps with Google Play, a portal for Android apps on tablets. Watching students improve their test scores and grades with Google tools has been incredibly rewarding, but the biggest impact of going Google is the new level of enthusiasm students bring to the classroom. When students are more engaged, they learn better -- our kids have proven that to us. Creating a learning environment in which students are truly engaged with technology distinguishes Mater Dei as what we like to think of as a school of the future.